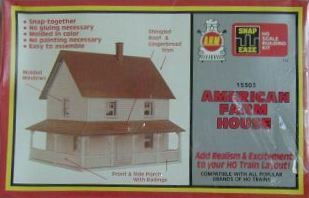 AHM's 1981 catalog introduces a set of six structures in the Snap Eaze HO Scale Building Kit series. The Snape Eaze kits included: Rural Freight & Passenger Station (No. 15301), Country Barn (No. 15302), American Farm House (No. 15303), Suburban Ranch House (No. 15304), Switch Tower (No. 15305), and Locomotive Maintenance Building (No. 15306). Five additions are new in AHM's 1982 catalog: School House (No. 15307), Country Church (No. 15308), Texaco Service Station (No. 15309), Operating Gravel Loader (No. 15310), and Two Suburban Houses (No. 15311). The 1982 release Two Suburban Houses replaces the 1981 Suburban House kit. Both feature the same tooling, the '82 offering simply provides two of the same kits cast in differing colors. The Snap Eaze line saw a separate group of four offerings presented in 1984, the Snap Eaze Operating Building Kits. The previous Operating Gravel Loadeer (No. 15310) was joined by three offerings: Operating Pipeloader (No. 15312), Operating Barrel Loader (No. 15313) and Operating Log Loader (No. 15314).